Who is it for? Loreal Hair Spa Olive Oil can be used on all types of hair, especially dry hair. It is an extra nutritive vitamin E enriched olive oil for hair suffering from dryness and frizziness. 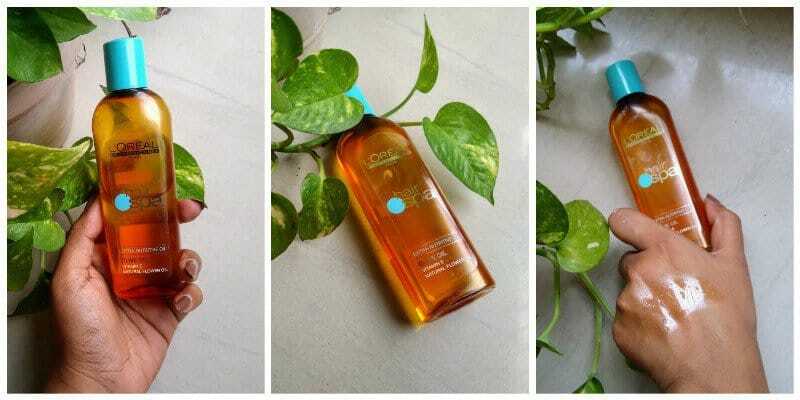 The L’oreal Hair Spa Olive Oil comes packed in an orange colored plastic easy to hold the bottle. The L’Oreal Hair Spa Olive Oil has a very pleasant floral and sweet smell. The fragrance comes from the natural flower oil used as an ingredient in the preparation of the oil. Massage the oil generously in a circular motion all over the hair and scalp till it gets absorbed completely in the scalp. I used the L’Oreal Hair Spa Olive Oil as a pre-shampoo hair booster and I am completely swept off my feet by the amazing results. In one time use only, it left my hair soft and manageable. The dryness and frizziness were gone and my hair felt a lot healthier and voluminous. What do I like about the oil? Absolutely I will recommend L’Oreal Hair Spa Olive Oil. Sounds to be great… Has nutritive values and even plesant fragrance…. Can opt for this !! !